Geochrons are custom built by hand. The Boardroom Model is our "top of the line" Geochron. It is a bit larger in size (36" x 24" x 5") and looks best if "flush mounted" into the wall. Flush Mounting Brackets are included. This model can be customized to match the wood decor of your home or office at no extra charge (wood species, stain and lacquer details required). The functionality of the Boardroom model is entirely identical to the Original Kilburg. The map size is identical, it has a minute analog dial in the top right hand corner and the light pattern changes in accordance to the date. The front panel is a choice of six natural wood veneers, but unlike the Original Kilburg model, the Boardroom model has a customized molding design (see image to the left) as opposed to a flat edge. This adds to the overall size of the model (widening it by approximately two inches in width and two inches in height) and presents a much more artistic style. Size: The Boardroom model is 36 1/4? Width x 24 3/8? Height x 5? Depth. Availability: Each Geochron is custom built by hand. Production time is 2 to 3 weeks before shipping. -Features molded wood panel, gold anodized trim and components designed to protect inner working from atmospheric elements. -Choose from nine finishes (Natural Oak, Light Oak, Spice Oak, Cherry/Cherry, Amber Cherry, Black Oak, Natural Cherry, Walnut or a customized match to your specifications). -Limited edition plaque, plus flush mount kit. -Available in standard 12 hour or military 24 hour formats. -Front panel size: 34 1/4" x 24 3/8"
-Quality USA construction. One-year warranty. The Geochron Boardroom is an Analog world timepiece that displays time, day, date and duration of daylight and darkness everywhere in the world, at a glance! Replicates the rotation of the Earth on its axis. Displays ever-changing light pattern as the Earth revolves around the sun. A precision analog timepiece that features the time in all 40 legal time zones. Indicates sunrise/sunset, the sun's declination and day of the week. Shows the exact portions of the Earth that are in daylight and those that are in darkness. Light pattern changes with respect to the daylight changes during the seasons. Includes wall surface mountain hardware. Unlike conventional clocks, which indicate the time at one point only, the Geochron World Clock indicates the correct time everywhere. The Geochron World Clock actually moves as you watch! Ever-changing areas of day and night make a complete cycle every 24 hours and gradually changes shape with the seasons. 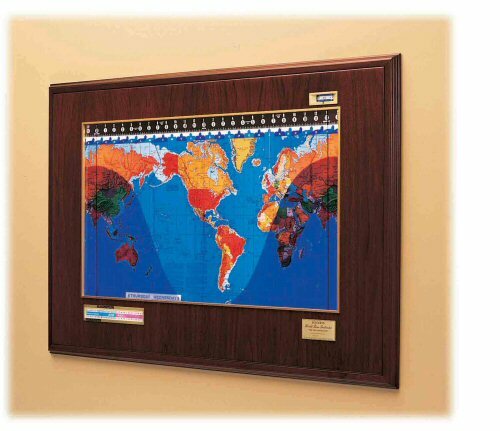 All in vivid color, the Geochron World Clock looks like a framed Map of the World. Today in our age of jet travel, the Internet, computer technology, and international involvement, more and more people have an interest in knowing what time it is somewhere else - often halfway around the globe. Governments, international traders, banks, insurance companies, hotels, airlines and education establishments to name a few have recognized the invaluable information that the Geochron World Clock provides. One of the most fascinating features of the Geochron World Clock is that it automatically shows where on earth it is daylight or darkness at the moment the map is viewed. See sunrise, high noon and sunset as they happen around the world. Days of the week and dates of the month that prevail at any given instant are also shown. Thousands of the Geochron World Clocks are in use around the world in a variety of companies and organizations. The Geochron World Clock's mercator projection map moves slowly from left to right under the protective screen at one inch per hour. It completes the cycle in 24 hours just as the Earth does. It's always high noon along the red longitude at the center of the map. This makes reading the clock simple, as it is always A.M. on the left hand side and P.M. on the right hand side. The left edge of the illuminated pattern indicates the moment of sunrise, while the right edge indicates the moment of sunset. The Geochron World Clock eliminates the confusion caused by time conversation factors, the International Dateline, and the question of A.M. or P.M. involved in the use of a 12-hour clock. With Geochron, the entire world time situation is seen at a glance. In addition to providing a worldwide overview of current time, Geochron can be manually moved forward to determine sunrise and sunset, and the hours of daylight at any locale on any future date. By following the zenith position of the sun, holidays or foreign trips can be planned for the most appropriate time of the year. Perfect for offices, boardrooms or for the globally-minded businessman, student or teacher. A Geochron is an elegant, functional art/conversation piece.